Wearable technology is nothing new. Forty years ago we saw the first digital watches, but even then some companies thought that the little computer on your wrist could do so much more. 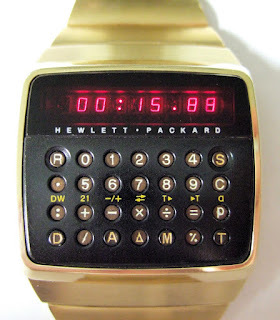 One such company was Hewlett-Packard, who decided to combine the functions of one of their famous line of calculators with a digital watch to come up with something quite unique. 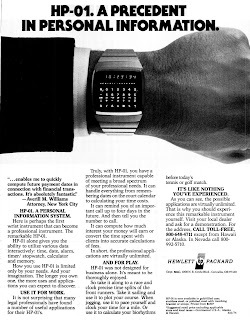 The HP-01 was what Hewlett-Packard called a "wrist instrument". Along the top were nine seven-segment LED displays, underneath were 28 keys. Four keys were raised (Date, Alarm, Memory and Time) so they could be pressed with a finger, two semi-recessed keys (Read/Recall/Reset and Stopwatch) plus 22 recessed keys that you pressed with the supplied stylus which was either a mini one hidden in the wristband or the end of a specially-designed pen. Inside were three batteries, two to power the display and one to power the tiny logic board. These batteries could be changed by a jeweller, or HP sold a special kit so that the user could change them. The watch itself was either housed in a steel or gold casing. It was much more than a digital watch with a calculator added on, because the HP-01 treated the time and date as just another data type. Rather like a modern spreadsheet application, you can take the time and perform mathematical functions on it.. but the HP-01 does it in real time. As an example, if you are making an expensive long-distance phone call then the HP-01 can be programmed to tell you how much it is costing in real time. The HP-01 was also cleverly future-proofed with a "21" button allowing dates to be programmed for the 21st century. 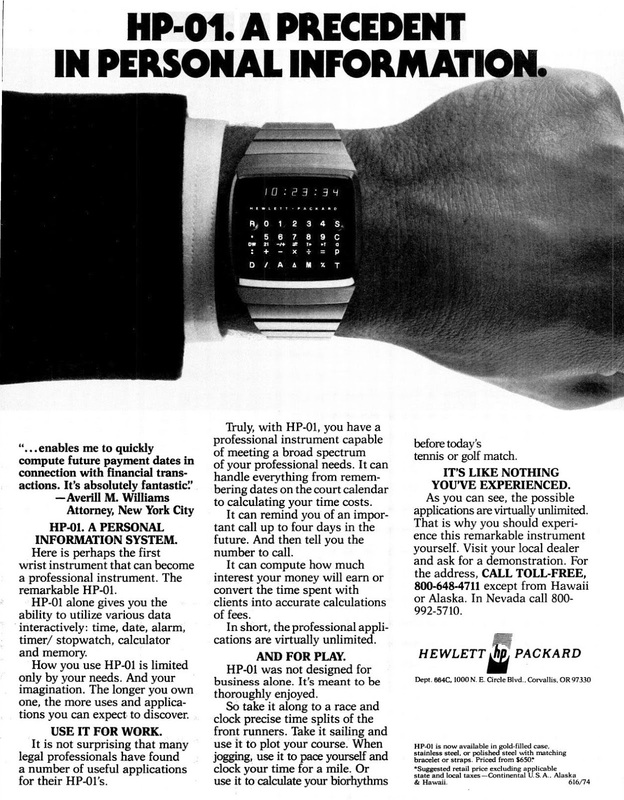 HP-01 ad, 1978. Click to enlarge. Truly, with HP-01, you have a professional instrument capable of meeting a broad spectrum of your professional needs. It can handle everthing from remembering dates on the court calendar to calculating your time costs. It can remind you of an important call up to four days in the future. And then tell you the number to call. It can compute how much interest your money will earn or convert the time spent with clients into accurate calculations of fees. In short, the professional applications are virtually unlimited. With prices starting at $650 for the base model (more than $2500 today) the HP-01 was quite expensive. It was also bulky and rather tricky to use and despite its unique qualities, it was not a success. HP did experiment with an upgraded version, but in 1979 they threw in the towel and production of the HP-01 ceased. 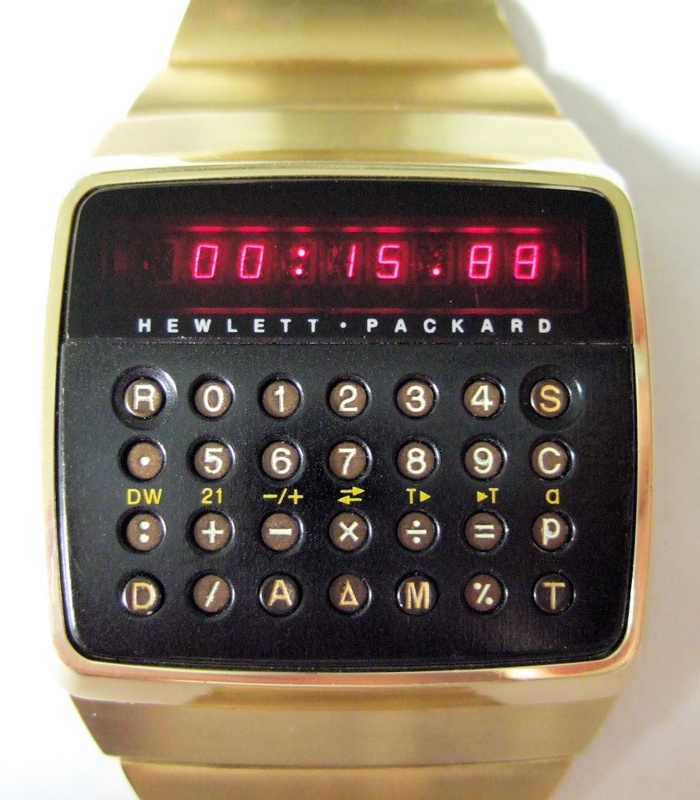 The HP-01 was Hewlett-Packard's first and last digital watch. Today the HP-01 is a fairly rare device, with prices starting just shy of €1000 for one in a reasonable condition up to several thousand euro for really good models. Of course, any type of contemporary smartwatch is several orders of magnitude more powerful... but even those devices are still solutions looking for a problem.